Wait! Stop! Don’t leave, you’re really at the right blog. It just looks all shiny and new! Too shiny really, I’m almost afraid to scuff it up by writing on it. I hope you’ll find the new design easier to navigate. It was turning into an overgrown hermit crab in a tiny shell. Although, this redesign wasn’t my idea. The whole thing was a big surprise. It was a gift from my great friend Kathia. I found if you fly to New York, give her a jar of Idaho mountain honey and treat her to a Cuban meal, she’ll send you the smart and talented Jessica from The Frilly Coconut. Jessica will know exactly what you want without you having to say much of anything, and then you’ll abuse her a bit by asking her to put in some tabs. However, Jessica is so nice she’ll put up with you anyway. Thank-you Kathia for this gift, and thank-you Jessica for being so fun to work with! I am grateful for you both. I think pizza is in order for a celebration like this. I hope you enjoy the new design and find it easier to navigate. This recipe makes two medium to large pizzas depending on the thickness of your dough. If you just want one pizza, throw half the dough in the fridge or freezer for later use. 1. Make the pizza dough 45 minutes in advance. Preheat the grill to high about 30 minutes into the rising dough. 2. Place the zucchini rounds in a bowl and toss with olive oil, garlic powder, onion powder, salt and pepper. Grill on each side until grill marks form. Place back in the bowl and set aside. Leave the grill on. 3. Sprinkle a medium or large good quality pizza pan with cornmeal and set aside. Divide the dough in half, sprinkle a clean surface with flour and pat out dough into circles using your palms and fingers. Move to pizza pan. Brush dough with olive oil. If you have a second pizza pan you can repeat the process now. 4. Place the Boursin cheese in a bowl and microwave for 20 to 30 seconds until creamy. Stir and spread thinly over pizzas. 5. Top pizzas with some mozzarella, onion slivers, grilled zucchini, parmesan, and sprinkle with salt and pepper. 6. Place the pizzas on the grill one at a time and cook for about 5 to 8 minutes per pizza, depending on how hot your grill is. The hotter the grill, the better the pizza and the quicker it cooks. You’re looking for a nice dark brown bottom crust. Check often near the end, it can go from done to burnt quickly. 7. Repeat with second pizza. 1. In a stand mixer bowl add the water, yeast, and honey and let sit for 5 minutes until foamy. Add the flours, olive oil, and salt and mix with the dough hook until well kneaded. Remove the dough and knead by hand for another few minutes. 2. Olive oil a large bowl. Remove the dough from the stand mixer and knead on a clean surface for two more minutes. Place the dough in the oiled bowl and cover with plastic wrap. Let the dough rise in a warm place for about 45 minutes before using. Love your new look and this beautiful delicious pizza too. Love the new blog design, it looks so nice and cheery! Oh and the pizza sounds amazing! I love Boursin but never thought of putting it on a pizza. HI THERE! i love the new look! I have some of that Bourshin cheese in the fridge, what a great idea! I am partial to orange, so of course I love it! Sometimes I think of change, but other areas of my life need it worse, lol! What a beautiful blog you have. I enjoy the clean and simple layout. This recipe looks fabulous. I love making home-made pizza, and this recipe makes me eager to try more. Thank you for sharing! Laura,you are the sweetest ever! I loved our dinner tasting, what I great idea you had. We have to go back to Victor's again. I still have honey,I use it as medicine with lemon for Camilla when she gets a bad cold. Thank you! I love your blog and you know how much your friendship means to me. Now I just have to look for a publisher for your cooking book! Thank-you Monet and everyone. That means a lot to hear. Kathia I'm not sure anyone would publish me. I'm so far away from the center of that stuff. Sigh... But hey this is fun anyway! Why do you insist on tempting me with such delights? Oh wow... I just realized you crossed over the 500 blogger followers threshold. Congrats!!! Great recipe, I love white pizza. I have a lot of zucchini I need to use up quickly - thanks for the idea for this pizza! wow che invitante!!! deve essere buonissima!! complimenti!! ciao! Wow, wow, wow! I did a double take , checking the address bar and everything :) What great friends (no anemones there..err...trying to work with the hermit crab thing here). Shaz that made me laugh. I live my life being punny. I can't believe I actually have a pretty blog. Jessica is amazing. Molto invitante la tua pizza, complimenti. Ciao Daniela. I'm so glad that you love your blog, Laura! That's wonderful! You can come to me anytime if you're in need of more design work! I love boursin cheese and never remember it enough.. great idea to put it with pizza and zucchini!!! I love the new design--LOVE IT! Love the new look! And the pizza... 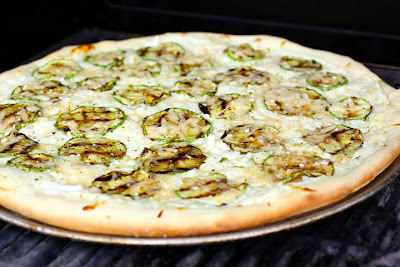 I can't get enough of grilling zucchini, and I still need to try pizza on the grill. Not sure what's taken me so long.